This photo scanning software will scan multiple photos at once, then separate and crop them automatically to help you finish scanning all your photos. in 2019: responsive user interface - drag and drop prescanned images to auto crop. in 2018: automatic color corrections - restore yellowed photos to vivid colors instantly. Scan multiple photos then separate & crop automatically faster than ever! Photo scanning app - 4 different methods of photo scanning. in 2017: Extract all individual photos from multiple pre-scanned photos at once. See animation and video and understand this application in 30 seconds. Designed for flatbed scanners, Windows 2000, XP, Vista, 7, 8, 8.1, 10 and Intel Mac OS with Windows. Multiple photo scanning software to help you finish scanning all your family photos. Thousands of users from 85+ countries enjoy AutoSplitter v1.8.13. The program is really really good - well done - its simple and it works. Thanks for saving me hours of work! How to auto crop scanned photos? This picture scanning software knows the answer. How can I scan multiple photos, crop them and save individually? Autosplitter remarkably simplifies the process of scanning, separating and cropping multiple photographs at once. Just place your photographs in your scanner, scan them with AutoSplitter and this utility will recognize individual images automatically. This is called batch or gang scanning. Photographs will be detected by this photo scanner software, split into separate output images. AutoSplitter will also deskew your photos. Of course you can adjust the clipping and rotation manually if you wish. Old photos are usually faded or yellow when you start digitizing them. AutoSplitter will revert these sad colors to their glory days. Your memories get resurrected in colors you haven't seen for decades. All popular file formats supported. Open BMP, JPG, PNG, GIF or TIF images. Crop and save scanned photos in JPG, PNG, GIF or TIF formats. DPI information saved (or carried over) for all file formats carrying DPI information. AutoSplitter saves a LOT of time and hassle for you. Ever tried separating, cropping and straightening your scanned photographs by yourself? It takes a lot of time and effort to do that. I'm sure you have a lot of precious photographs to digitize, but you just could not bring yourself to scan and edit all these images. This is your chance to catch up with that task! See this article about benefits. Family photos collecting dust? You need this software to auto crop scanned photos. Almost every family has got lots of old family photographs lying around in boxes, cupboards and yellowed albums. Your kids and grandchildren must see them when they grow up! Save these photos for eternity, scan them! 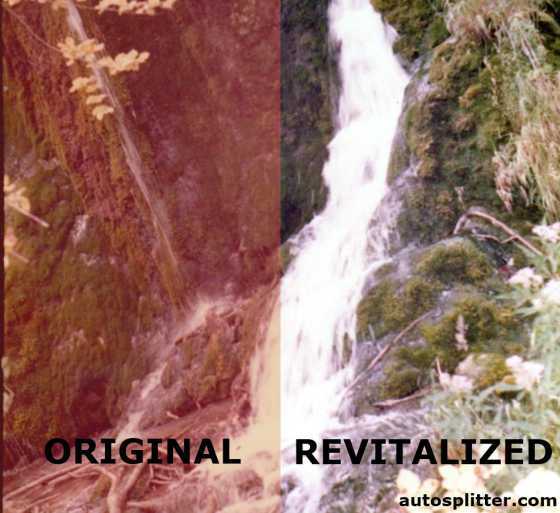 With AutoSplitter photo scanner software, you can scan multiple photos at once quickly and easily. This is the best way to copy old photos to digital format. Forget the annoying hassle with image editors, this utility knows how to separate multiple scanned photos. Your time is precious, do not waste it cropping photos in an image editor. Scan your family photographs with AutoSplitter and save lots of time - this software will greatly simplify the process of cutting out, straightening your photos from the scanned image. Family photos are irreplaceable - once lost, you will never recover them. Digitize your photo collection and choose the best way to scan photos to make sure these valuable memories will be preserved for your kids and grandchildren. This Windows application provides great help in scanning and securing these images quickly.